The matching FREEBIES with journal boxes and a Bible verse margin strip is at the bottom of this page. 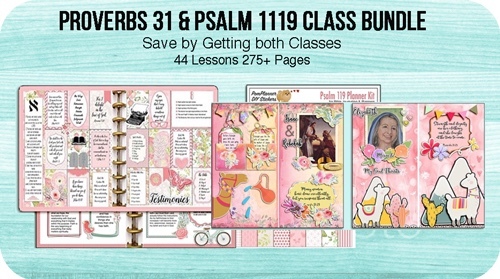 Fits Bible & Happy Planner too! Printable Planner Kit in Pink & Coral February Victorian feel, Valentine, lovely lambs, romantic Bike, heart balloon, roses, Hearts, flowers, Bible Verses, Coffee Cups, Latte, Icons, glitter elements, frames, banners, washi, and oh so sweet cupcakes, and macroons. Five 8.5x11 pages PACKED full of Beautiful Pinks and coral banners, roses, flowers, hearts and romance for anytime of year but especially February. I like to Bible Journal in my planner. I created the sweet lambs to journal sheep verses but need up Bible Journaling 1 Corinthians 13 the love chapter. I found a super cool free Bible study tool online. Its a Cross Reference. About 340,000 cross references identify commonalities between different parts of the Bible—chains of similar themes, words, events, or people. All you do it type in the verse and all the references pop up in boxes (you know I have thing for boxes). The verse you typed in shows in the first box and the cross references follow. Check it out and bookmark it. Here I typed in 1 Cor 13:7 and this is only a portion of the verses. You can use Photoshop Elements to Turn the Bible References into this! Learn to Create Digital Pages on your Computer $20 Coupon! All my printable kits (and I only do printable kits) are available in both Happy Planner and Erin Condign sizes. Instead of creating some boxes with frames and some without all the boxes are patterns and you download the free journal boxes below to go on top when you need them. And remember, you can print as many as you need! This link will take you to a safe download where you can get the free planner stickers and/or the Linked Bible Journal Infographic (open and click the links to read articles). You can thank me by sharing this page! There are several ways you can use this printable. Print it out on a full sheet of white sticker paper. I cut with a paper trimmer and a circle hole punch. If you own a Silhouette Cameo or Silhouette Portrait or other digital cutter you can cut out the to-do lists or planner stickers using their designer software.